Selected staff members have been granted access to refund print jobs in the new print control system. There was a paper jam or the document failed to print correctly. The document failed to print at an acceptable quality. As a staff member, you will make an assessment about whether or not to issue a refund. A print job can be fully or partially refunded. A full refund is the more common scenario. Log in to the PaperCut NG/MF Admin web interface at http://servername:9191/admin using your network username and password. Find the user to refund from the Users tab by entering their username in the Quick find box or clicking their username. Click the Job Log tab. The recent print jobs printed by the user is displayed, with the most recent at the top. Find the print job that needs refunding; then click the refund link next to it. Users can send refund requests via the User web interfaceThe User web interface provide a range of services for users, including a summary of usage and balance history, a list of the shared accounts that the user can use for printing, the current costs for printing usage, ability to add balance by using a TopUp/Pre-Paid Card or an external payment system (when using the payment gateway module), transfer funds to other users, view a history of balance transactions, view a list of the user's recent printing, and view print jobs pending release (when using a Release Station).. For more information, see Refund print jobs. 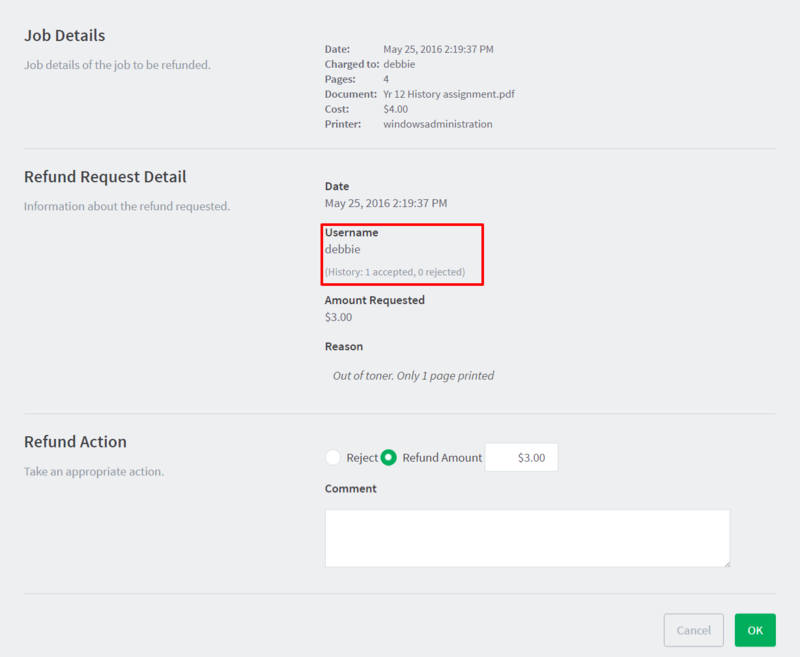 The User Refund Requests page is displayed. Locate the user's refund request. To approve/reject click the approve/ reject link. To view an overview of user's refund requests, click the other link. 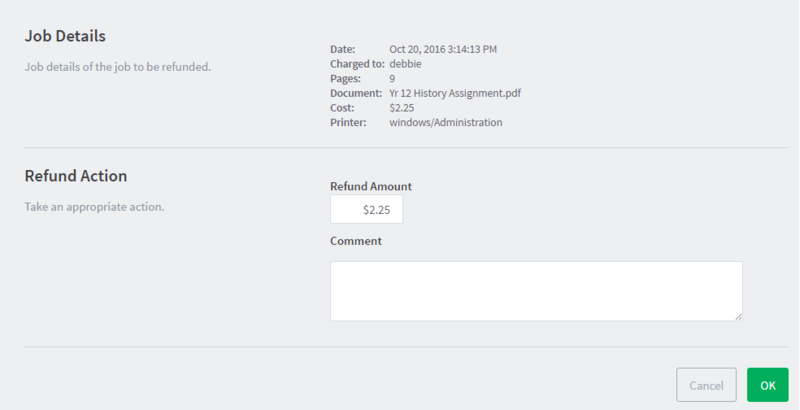 Use this to edit the refund amount and write a comment.